My baby changing bag is huge, which in some ways I love, but on the negative side, I can never find anything, which is especially frustrating when we are out and about. 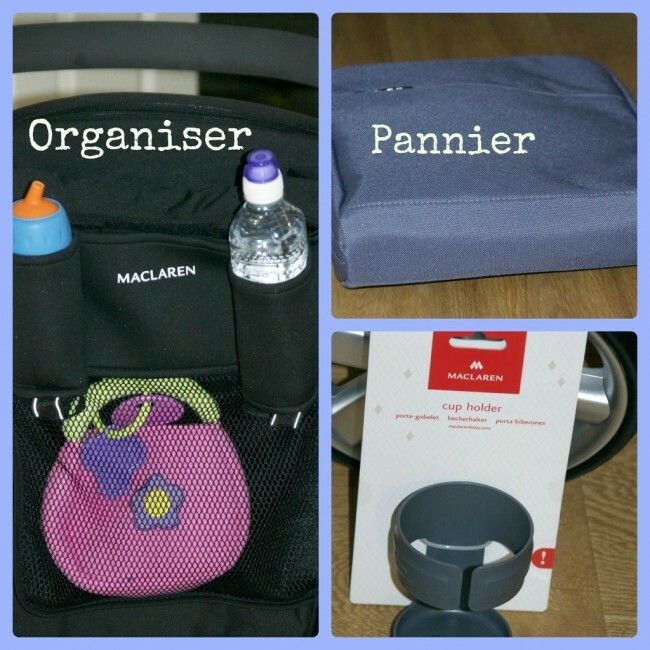 This buggy organiser from Maclaren has been a huge help. It is very compact, and even folds up with the buggy. The organiser holds two drink bottles, has a pocket for valuables and a big mesh interior for all your other bits and bobs. I’ve loved using it on day trips as the children’s drinks are ready and available whenever they need, no more spilling all over my bag, and my purse and keys are always handy as well. I wouldn’t be without it. The buggy organiser fits all single buggy’s and has easy attachable velcro straps. The pannier is also super handy, and fits all Maclaren and umbrella fold buggy’s. It is fully insulated to keep drinks and snacks cool and also has a removable bottle divider and a built in handle. It fits securely to the side of the buggy, making the contents very easy to access. I haven’t actually tried the cup holder as it doesn’t fit on my current buggy, but it feels very sturdy, and can hold bottles, cups and cans. It would be brilliant for holding my coffee while I’m out. All three accessories are the usual high quality you expect from Maclaren. We were sent the products above for the purpose of this review.